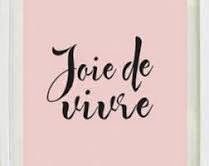 Joie De Vivre is a French phrase used to express a cheerful enjoyment of life; an exultation of spirit. I came across this word while reading “Secrets of an irresistible woman” by Michelle McKinney Hammond and since then, I saved it in my hard disk drive upstairs. Unfortunately, this naija wey we dey, the hustle and bustle of life has worn most of us down to a pile of complaints to the extent that all we see is the less joyful side of things. Everybody is really trying to meet up that target but that doesn’t restrict you from celebrating LIFE itself. Irregardless of whatever you’re passing through, find joy in the little things that matter. You slept last night and you wake up hale and hearty, my guy, thank the Lord.